Read the Mail’s new series ‘The Art of Angling’ by ace artist and specialist angler Chris Turnbull. 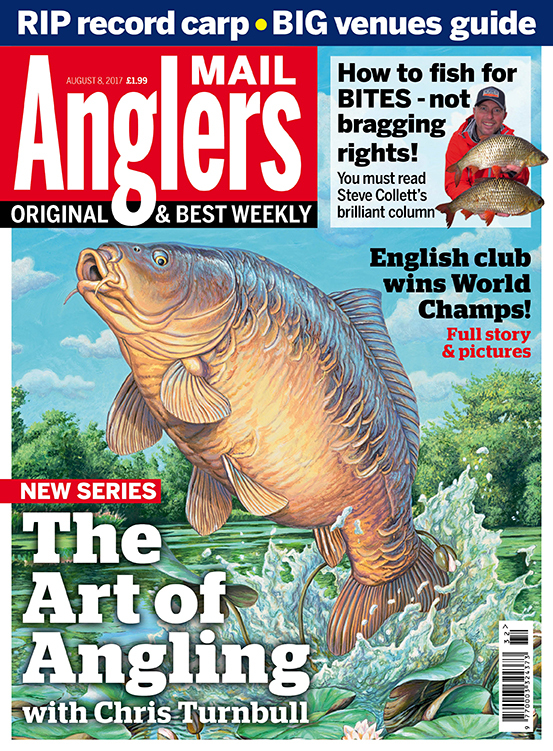 It’s his stunning artwork of a leaping carp on the front cover… a real collector’s edition! The British record carp, The Parrot, has sadly died. Read our tribute including an exclusive eye-witness account from the angler who found this epic fish. Steve Collett, the unique Angler’s Mail columnist, tells you how to fish for bites – NOT bragging rights! The BIG venues guide in Angler’s Mail magazine is essential reading too. It’s by genuine regional experts. DON’T MISS THIS ISSUE OF AM PRINT MAG! Get yourself a subscription to Angler’s Mail print magazine at a great price – visit www.anglersmail.co.uk to subscribe and SAVE! WHERE TO CATCH CARP – OUT NOW!